4 men were killed and 2 others were severely injured when attacked by a pride of lions in the Hwange National Park, Zimbabwe. Apparently, all the victims are local poachers who were illegally hunting for elephants in national park, when they were surprised by a group of almost twenty adult African lions, the same species as Cecil the Lion, who died a few kilometers from the site in July 2015. The attack was so sudden and violent that four of the nine men were killed, two severely injured and three were only lightly injured, while the animals were unhurt. Reportedly, the poachers who survived abandoned their dead comrades and hurried back to a nearby village for medical care; where they were arrested. Zimbabwe Republic Police Commissioner-General, Augustine Chihuri, told reporters that the poachers were visibly terrified by their experience and he hopes this incident serves as a lesson to other poachers. The Commissioner-General of Zimbabwe Republic Police, described the scene as “a horrible blood bath”. 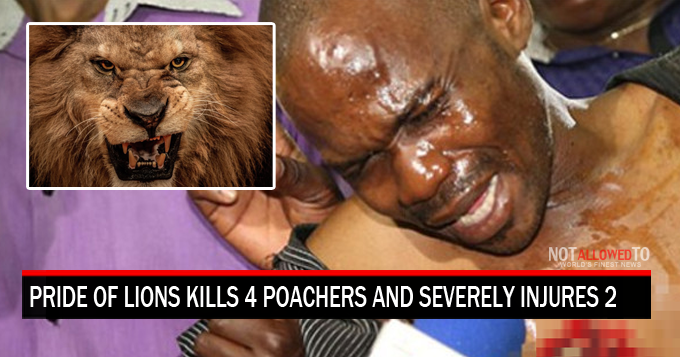 The surviving poachers will now face a wide array of criminal charges. The charges brought by prosecutors include illegal-hunting, possession of illegal weapons and contravening the Parks and Wildlife Act. They will be facing sentences of up to 25 years in jail and fines of up to US$100,000.